Ask students to select a word or truism and create it out of the something that represents that word. Select something and make a word or truism from it. The word or truism should be anything that they think stands for understanding and progress in the world. Example: LOVE shaped by flowers or one flower shaped into the word LOVE. Other words: JUSTICE, PEACE, SUSTAINABILITY, LIFE, JOY, HAPPINESS, FEAR, RECYCLE, CONSERVE, SHARE, GOOD, CRASH, SMASH, CONFLICT, GUILTY, INNOCENT, EVIDENCE, CARE, DECIDE. Share only enough examples to get students started. A truism is any saying that helps us such as: A stitch in time saves nine, A bird in hand is worth two in the bush, The apple never falls far from the tree, and so on. Students should be given extra credit if they invent new truisms like: Fair play means changed minds, or The victim must not to be blamed. Form four or more teams to make lists of words and short truisms, making it a contest to see which teams can generate the most usable meaningful words and truisms that help us understand the worlds in which we live. Work with the class to develop a set of scoring guidelines. Have each team's list scored by three other teams to assess and give points to each team. Make a master list on the board. Questionable words or truisms are placed to the bottom of the list. No two students may work on the same word or truism. Draw names to randomly decide who begins. Allow each student to claim a word or truism. Each student must claim a different word or truism. Each individual makes a series of sketches for graphic interpretations for their selected word. Teams reassemble to discuss sketch ideas. The end of the the lesson, the student teams present and discuss art by Jenny Holzer, Robert Indiana, and other artists who use words as art. 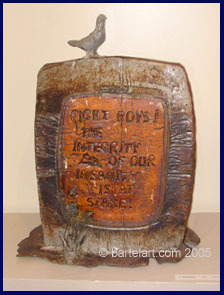 Inscription on tombstone: Fight boys! The integrity of our insanity is at stake. In this example, I use a bird speaking through a tombstone inscription to declare the absurdity of the war and death during the Vietnam War. Another tombstone in the series, has the inscription: Hush bird, thou buggest me. Drawing Instruction - Does it Transfer? For permission to make copies or handouts, contact the author. Teachers may print a copy for their own use so long as the copyright information is with the copy. You may make links to this page from other web pages.